Some of the word definitions from Merriam-Webster dictionary describe the word ‘encourage’ this way … to make (someone) more determined, hopeful, or confident; to inspire with courage, spirit, or hope; to spur on. Sounds nice doesn’t it? In an orphan world system where we often experience the very opposite of this description, these beautiful words should be music to our ears. The reality in life is that we all need as much encouragement as we can get. I’m not sure what the number is, but I have heard that it takes many encouraging words to counteract just one negative word spoken to a person. If that is the case, then I’m guessing that our God and Father is continually sending positive words of encouragement our way! But the question is, are we listening? Many times we are so attuned to the negative voices that come our way, that when we hear positive, loving, encouraging words, we simply dismiss them as being not for us. In this week’s blog, I just want to add my voice to all of the voices of heaven who are cheering you on in your race! If we read Hebrews 11, we will read about the great heroes of faith that are chronicled throughout the Bible. I find it interesting that Hebrews 12 continues by saying that these same heroes are cheering us on in our race too! What a beautiful picture this paints. Every hero of the faith who has gone before us, is seated in a Roman Coliseum-like arena, standing on their feet, cheering us on as we continue to run our unique race. But not only are they cheering us on, but our Elder Brother, Jesus, has His eyes fixed on us as we head towards the finish line. I’m not sure how much aware we are of the supernatural support that our Heavenly Dad has given to us to encourage us along the way. The Bible says that the angels are ministering servants to the heirs of salvation (Hebrews 1:14). Scriptures also say that we have been given God’s own Spirit as a deposit to guarantee our inheritance (2 Corinthians 1:22). And if that wasn’t encouragement enough, our very lives have been joined with Jesus so that we get to seat in heavenly places with Him in the spiritual realm right now (Ephesians 2:4-7). There is no question that if we have ears to hear what the Spirit is saying, we will hear wave after wave of loving encouragement that comes from the Godhead. 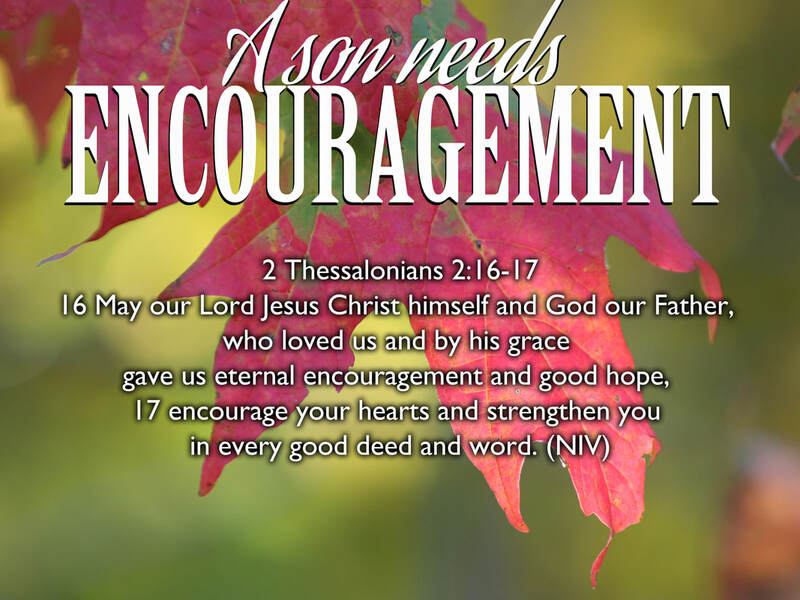 The focus Scripture for this week’s blog from 2 Thessalonians 2:16-17 tells us that it is God’s great love for us that motivates Him to strengthen us with His eternal, never ending, never changing encouragement! From the Father’s perspective, each one of us is a masterpiece that He created to do the good works that He prepared before the foundation of the world (Ephesians 2:10). Think of it this way. If I were to build something for a purpose, it would be my heart's desire that the thing that I built would do what I created it to do. If I fold a piece of paper and make a paper airplane of out it, I want it to fly! The better it flies, the more satisfied I feel as it's creator. How much more does our heavenly Father want us to succeed in everything that we do in life? Now when I say ‘succeed’, I do not necessarily mean that we will become the top of the food chain in whatever we desire. I think it is helpful for all of us to remember that the value system of the Kingdom is not the value system of the broken world that we live in. So succeeding for you will looking completely different to what succeeding means for me. I cannot think of a better description of true success other than being who our Father created us to be. It really doesn’t get any better than that! When I am who my Papa intended me to be, I think heaven gives out a big cheer because I am reflecting the unique image of God that no one else ever created can reflect. I believe the more that we have ears to hear what the Spirit is saying, the more we will experience the loving, encouraging words that derive from our Father who is pleased with what He has created (Revelation 4:11). If we just take time to listen, I believe that we will hear our Father cheering us on as we take one step at a time towards our destiny. For some, it might be the first steps of a little baby learning to walk, and for others, it might be a full out sprint as we near the finish line. But either way, the rock solid revelation of the Bible is that God is for us (Romans 8:31). I will say it again. Your God is for you. He believes in you. He loves you with the perfect Father’s heart (1 John 3:1) and He created you before the foundation of the world to be a reflection of His image to a fatherless world. Whether we feel loved and encouraged or not, every believer in Christ has this hope. We are our Father's handiwork, and we are called to fulfill our destiny as His beloved sons and daughters. An orphan heart that is not yet convinced that they are loved, will tend to look horizontally for the affirmation that tells them who they are. One of the ways that they seek this affirmation is by looking to other people to find true acceptance. For many people, this is expressed in trying to please every person they meet. Unfortunately, I consider myself an expert in this field. I grew up believing that my own personal value and self worth was directly hinged on the approval of others. This led to an exhausting life on a treadmill of trying to please every person in every situation. It wasn't until I began to receive a deeper revelation of the unconditional, eternal love of God my Father, that this vicious cycle of people pleasing began to change. I am not saying that I am completely done with this, but I am at a better place now than I was before I knew that my God and Father was my greatest encourager. My prayer today is that we would all know that we are secure in the family of God, with Jesus as our big brother and God as our Father. My hope is that each one of us would be free from living a life of seeking affirmation from others and begin to hear more of the words that come from heaven declaring who we are in Christ. I pray that we would all come into a deeper level of the glorious freedom of the sons of God (Romans 8:19-23) and fix our eyes heavenward for the encouragement and affirmation that is ours simply because we are God’s kids.